3 bedroom 2 bath home with ocean views in a quiet neighborhood. Hale Kai is a woodsy custom house in the Hawaiian Shores community. Just a few steps from the ocean, Hale Kai gets ocean views from the massive private porch upstairs from the loft master suite. At night, you can use the telescope to gaze at the starry sky with no obstructions. During the day, guests can relax in the hammock on the lower deck and enjoy the sounds of waves crashing against the rocky cliffs. The master suite is located on the top floor with its own full bathroom and downstairs is the main floor with two bedrooms, full bathroom, living room, dining room and kitchen. Both bed rooms downstairs have queen size bed with one of them has an entry way to the partial wrap around deck. 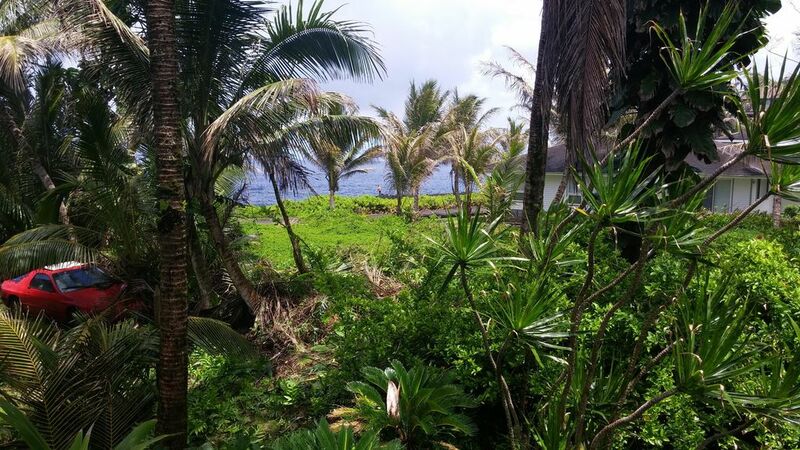 Hale Kai is located in a peaceful neighborhood which is perfect for walks down to the ocean where during winter time, you can see whales swimming by. Approximately 6 miles from Pahoa town, it is conveniently located close to stores and places to eat. Just 15 minutes away, you could catch a lava tour boat or hike in to see the lava flowing into the ocean at Kalapana. It's a perfect house to have a Hawaiian vacation. Just a block from the ocean. View of Mauna Kea from the driveway. Ocean view from upstairs and downstairs porch. Air conditioning available in 2 bedrooms. Fully stocked kitchen. No napkins or paper towels provided. A very lovely 3 bedroom, clean, well appointed, great kitchen, big lanais. We enjoyed the dramatic lava cliffs steps away with the gigantic crashing waves. Right on Beach Road, 10 minutes to where the new lava went to the ocean. Peaceful, relaxing, we could hear the surf and feel the headwinds all night. You are about 30 minutes to Hilo and 50 minutes to Volcan to National Park. Several grocery stores on the way. All expected amenities in place, plush linens, making are entire stay resort like. We have enjoyed this piece of heaven twice now and will return. My sister-in-law was with us this time and at the end said she had not been so relaxed in 15 years. The house is set back far enough from the ocean to not get much salt spray but it is very pleasant to listen to the waves crashing and see the ocean. The house is lovely and roomy and very well priced for its size and location. The furnishings are nice. Zee is a good host. We really enjoyed walking along the waterfront including the natural areas to the South. There is about a mile of waterfront to walk along. With the waves crashing against the low cliffs, it is very dramatic. A drive South from the house along mostly one lane Mango Road (also known as Government Beach Road) takes you to the lava flow. The road goes through deep jungle and is one of the most beautiful in Hawaii. There is also a good viewing spot just to the East of Pahoa village on Rt 132. The lava stopped flowing in August and the eruption is officially over. If you have time the trip down to Kalapana and up to Pohiki park is incredible. The lovely road with hanging vines and brilliant flowers goes over three short flow areas. You can look up and see the fissures. There is a beautiful new black sand beach where a boat landing and deep bay once was. Locals are using it for surfing but it is still dangerous with big rocks rolling around in the surf. But Zee has beach chairs and you can enjoy sitting out on newly formed land and watching the waves. Property was adequate for our needs. Location also fit well into our plans. Nice place, we had a great vacation. Peaceful. Loved the sound of the frogs at night. Great time except for the Hurricane, still have fun! The rental home is located on the east side of Hawaii and is 6 miles from Pahoa town and 26 miles from Hilo. It is a short drive to the nearest lava flow into the ocean and about a 45 minute drive to an hour to Volcano National Park. Rates are subject to change until dates of stay are confirmed and paid in full.